Summary: Believers deeply desire and often valiantly struggle to remember the God of their salvation when facing suffering and death. Job wanted his confession “I know that my Redeemer lives” carved in stone, the letters filled with molten lead, so certain was he of his eventual resurrection and everlasting life in the Lord (Job 19:23-27). In our text, the Lord tells Jerusalem that He also has made a carving of remembrance, this in the palms of His own hands. While He was addressing Israel figuratively, in Christ He later opened His literal flesh-and-blood palms to crucifixion’s engraving. 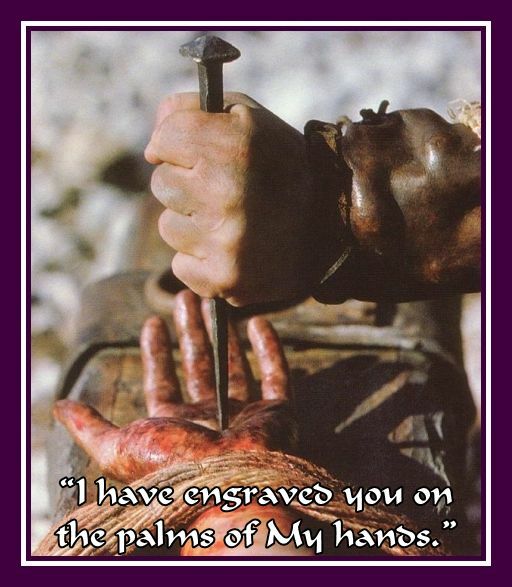 Even while Golgotha’s nails named Jesus as “sinner,” God also made Christ’s palms a memory book, wherein could be recorded Jesus’ wondrous name of love. By the power of the Holy Spirit, this name becomes ours through Baptism and the Word. Yes, dear saint, your name is written on the palms of the Lord for Him to see, to remember, and to love you forevermore. Text: Sing for joy, O heavens, and exult, O earth; break forth, O mountains, into singing! For the Lord has comforted his people and will have compassion on his afflicted.